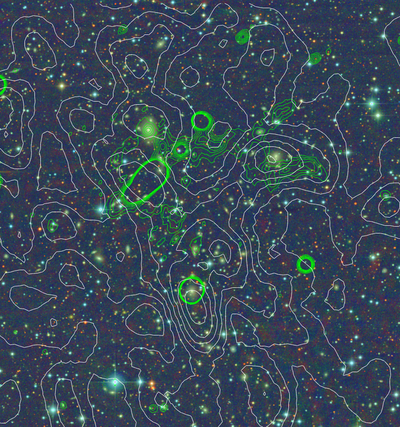 Little has been published about Abell 523. Giovannini et al. (2011) were the first to note the diffuse radio emission associated with the cluster. 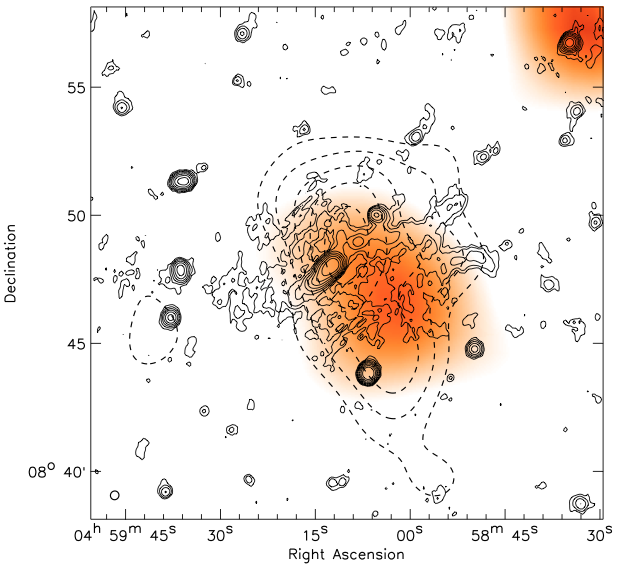 They found a north-south bimodal distribution of galaxies with X-ray emission (from ROSAT) between and also elongated in the north-south direction. 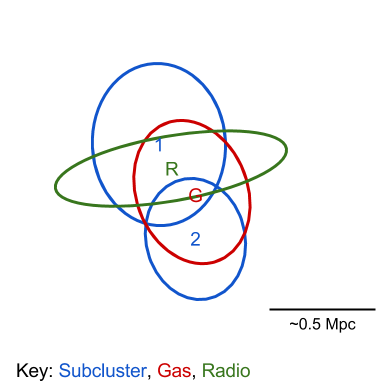 They classify the diffuse radio emission as a radio halo but note that the radio luminosity is abnormally high given the X-ray luminosity, which is also lower than that typically associated radio emitting clusters. 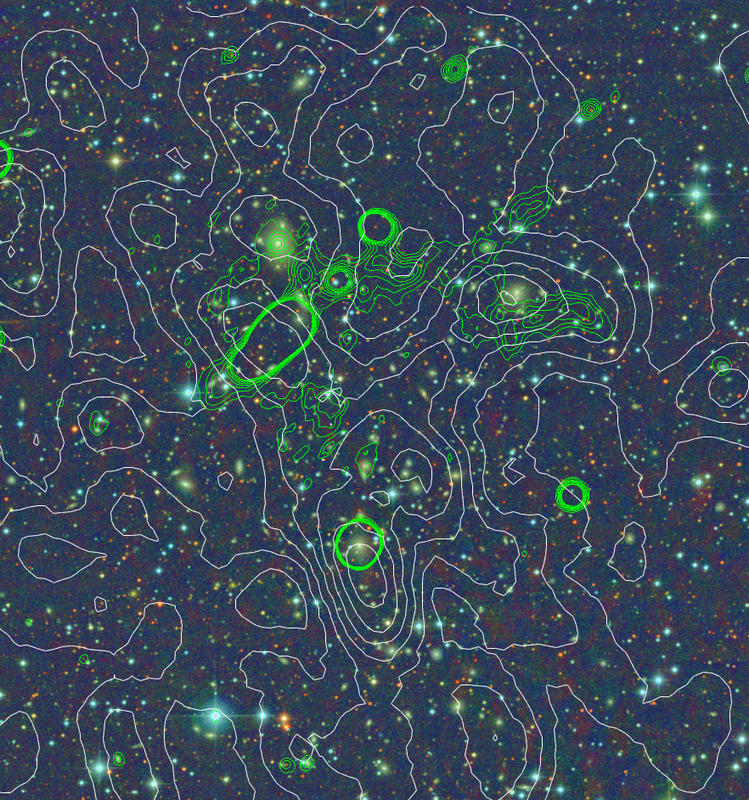 They also noted that the elongation of the radio halo perpendicular to the elongated distribution of gas and galaxies is atypical. van Weeren et al. (2011) confirm the diffuse radio emission and bimodal galaxy distribution with deeper INT VRI imaging. However they suggest that the diffuse radio emission should be considered as a possible radio relic as it has patchy morphology and given its perpendicular distribution to the cluster gas (atypical of most radio halos). Based on the van Weeren et al. (2011) ROSAT, INT, and VLA image. Giovannini, G. et al., 2011. 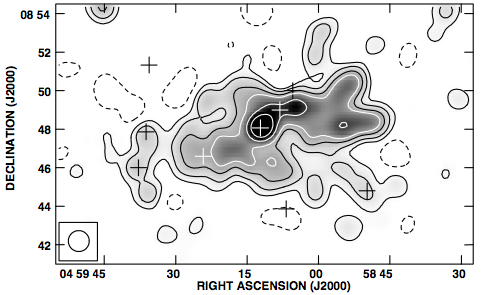 A giant radio halo in the low luminosity X-ray cluster Abell 523. Astronomy and Astrophysics, 530, p.L5.